Automated Telecom offers two paging services. We have numeric paging and alpha paging. Alpha paging allows you to email a pager with a message from any computer or smartphone with a data connection. Numeric is used with voicemail systems or other notification systems. There are two pager models to choose from and more information on each model is below. Our goal is to offer a paging service for the Medical and Field Service businesses. It is an excellent and cost effective service for specific communications needs. We have a large construction company that found the alpha pagers, details below, allowed them to give each of their staff members a cost effective communication device (low fixed monthly cost, low hardware cost and no contract). The manager used a group email to send emails to groups of staff members so they would know where to report to work each day/week. This allowed the manager to simply compose an email and send and saved time by not having to call everyone to let them know where to report. Since some of their staff didn’t have cell phones or there was a language barrier it made affordable and simple. We have several companies like Air Conditioning, Plumbing and other 24 hour service companies. There phone system/voicemail works like they need it during the day. At night it becomes their answering service. The pager is an affordable and separate from their cell phone to notify the on call technician there is a new emergency message. The system can also connect the caller directly to the technician. Many physicians or other professionals receive many different types of notifications on their Smartphones. 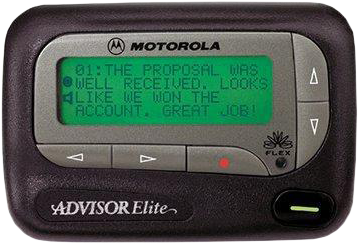 An Alpha or numeric pager is an excellent way to differentiate an emergency notification from your voicemail or answering service. When you receive the notification on this device you immediately know and it is not lost in the several notifications of your smartphone (text, voicemail, apps). 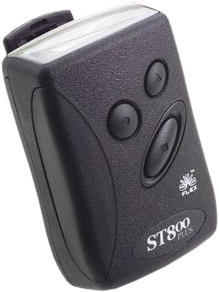 The ST 800 Plus pager is reliable and easy to use as well as affordable, and provides many features that incorporate the most advanced electronic paging technologies. The Motorola Alpha Elite provides exciting capabilities in messaging and can become a vital part of your business and personal life. This pager can be activated with numeric or alpha service. The pager’s four-line display and expanded functionality incorporates many of the most advanced electronics, communications and wireless technologies available. 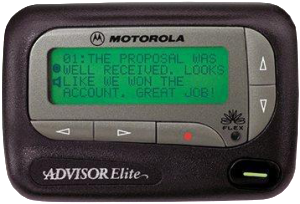 The Advisor Elite pager uses FLEX® technology. FLEX technology extends battery life up to four times longer than ordinary pagers and improves the ability to receive messages. These compact pagers integrate messaging and timekeeping functions in a package that is convenient to carry.